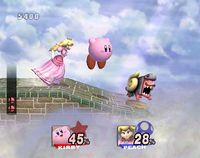 Trophy Stands are items in Super Smash Bros. Brawl, in the adventure mode of the game, The Subspace Emissary. They are basically the bottom part of a trophy. Since the player can't get certain Subspace Emissary enemy trophies by other means, the player needs this item to turn them into collectible trophies. The Trophy Stand turned the Towtow into a Towtow trophy. The player has to find an enemy, and pay attention to its health meter. Then when the health meter is low, the player must throw the trophy stand at the enemy, and the enemy becomes a trophy that can be taken and seen in the Trophy Gallery. Some weak enemies can be captured regardless of how much damage it has taken. Trophy Stands can also be used on bosses, although the player has to weaken the boss's health low enough that throwing the stand will defeat the boss. On a side note, not all enemies can be turned into trophies with Trophy Stands. Also, some bosses have alternate forms, which can't be earned through Trophy Stands; they're earned by clearing certain challenges instead. 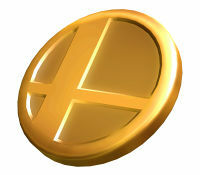 Wii Super Smash Bros. Brawl An item that, when hurled at Subspace goons, will turn whomever it hits into a trophy. Trophies can be collected, then viewed in the gallery. To successfully get an enemy, you need to hit it when it's been sufficiently weakened. If you can skillfully manipulate your foe's damage, you can even capture a boss character. This page was last edited on March 13, 2019, at 21:43.